Do you have one or more Ys in your name? Click here..., then enter your name to find out if they are vowels or consonants. 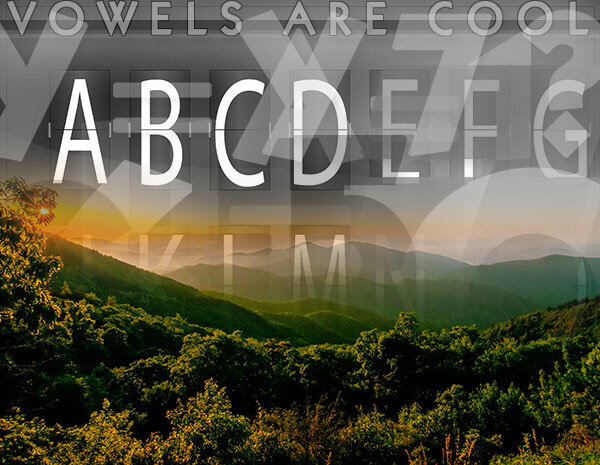 Vowels and Consonants are like mountains and valleys. Vowels are spoken without any restriction of the vocal cords, creating a peak sound within a syllable -- they are like the mountain tops - whereas consonants are the valleys of a language. To a numerologist, these characteristics have even more significance than to linguists. I have, in several numerology articles, pointed out that every number symbol represents a unique and well-divined personality based on the quantity it represents, but also that the shape of the symbol perfectly reflects that personality as well. The same is the case with letters. Look, for example, at each of the vowels. The letter A has a value of 1 and represents all the attributes of the 1. Its shape is a perfect symbol for the 1; masculine, daring, original, independent, progressive and leadership-oriented. Look at the shape of the A. It forms a spear point, stable and proud, and definitely signifies strength and independence. In addition, the letter A has some attributes that are amplified beyond the 1. It is more mental, less impulsive -- note how the A contains a triangular chamber elevated from the ground. The letter E has a value of 5 and its shape perfectly symbolizes the adventurous, undisciplined nature of a 5, including its ability to adapt to changes and unexpected events. Like the 5, the E can't contain much, especially material things. There is no enclosure, not even a bowl shape. And when you overlay the 5 on the letter E, only the lower half of the vertical line needs to be moved to make them basically identical -- and when it does, it resembles a yin-yang symbol as well as the center of a swirl -- reflecting the chaotic, dynamic nature of the 5. The E, like the 5, inspires and motivates others. It's horizontal bars are like arms, gesturing and enforcing its convictions. With a little imagination, you might expect them to start applauding, or communicate with red signal flags. The letter O is like a womb, has a value of 6, and reflects the loving, protective, caring and emotional nature of that number quite well. Notice also that many of the words representing things that comfort and protect us have one or more Os. For example: roof, home, work, root, room, dome, cover, comfort, protection, love, etc. Whatever it is the letter O encloses, it protects it, and keeps it close to its heart. The letter U has a value of 3 and symbolizes many of the 3's characteristics: imagination, the ability to receive visuals and verbal expressions out of nowhere, to be caught into the bowl of the U. It's verbal and musical talents are also reflected in the tuning fork shape of the letter. The letter U is also considered to be intuitive, as reflected in the two arms reaching skywards. The lack of stability in the 3 is symbolized in the shape of the U; it doesn't take much to tip it over. The fact that the Y is the only letter that can be either a vowel or a consonant is reflected in its shape: a crossroads, a point where a choice must be made. The Y has the value of 7 and its spiritual nature is seen in the V-shape elevated above the ground, as if reaching for the heavens, asking for insight and information. It is also a unique letter, and very symbolic for that matter, in that it is pronounced as a question, and one we should be asking more often than we do: why?